Tough going: The growing incidence of discrepancies in awarding contracts plagues the mining industry even as the new mineral policy seeks more private investment in the capital-intensive business. New Delhi: Indophil Resources Exploration Services Pvt. Ltd, an Indian mining company backed by Australian investors, has filed a lawsuit against the Karnataka government for the denial of a prospecting application because the state-owned Hutti Gold Mining Co. Ltd, the country’s only gold producer, claims right to the disputed area. The controversy highlights growing incidence of discrepancies in awarding contracts by taking advantage of opaque guidelines that cloud the mining law at a time when a new mineral policy seeks to boost private investment in the capital-intensive mineral exploration business. Bangalore-based Indophil has moved court on grounds that it has already spent Rs3.5 crore in conducting drilling operations, soil tests and other sampling in the disputed area of Karnataka’s Raichur district, north of where Hutti Gold has its current mine. Indophil is a wholly-owned subsidiary of Deccan Gold Mines Ltd, the country’s first and only gold exploration company to be listed in the Bombay Stock Exchange. The current mining law lays down that a prospector who has completed preliminary exploration must be a preferred candidate for the next stage of deeper investigation into mineral potential in a region, but the law does not confer an absolute right. Hutti officials, on the other hand, say that the company was the first to apply for 14 licences—in 1994—to prospect north of its current 528-sq-km reserve. The area has already been explored by government agency Geological Survey of India which has the first right to prospect as a first claimant, according to a company official who did not want to be named because the matter is under litigation. A government hearing held a few months ago informally had supported Hutti Gold for the prospecting licence, which Indophil is now contesting. 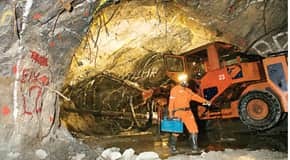 Hutti’s total reserve is about 18 million tonnes (mt), of which a little less than half has been exploited as it continues to mechanize and introduce new technology in its existing mine. India is a major importer of gold, consuming more than 800 tonnes last year, but produces only 3 tonnes, which is entirely through Hutti Gold. The gold jewellery market consumes more than half this amount at 521 tonnes. According to World Gold Council, gold imports have touched 521 tonnes for January-June 2007—a 72% growth over last year. This year, it expects imports to be in excess of 900 tonnes. Gold prices have shot up 67% from $377.8 (Rs15,376) a tonne in 2003 to $630 a tonne this past week. “Gold prices will continue to shoot up and we will not be able to augment resources overnight," said Sanjeev Jain, associate director at Ernst & Young. “We have actually not even started doing any serious gold exploration." The mineral sector was liberalized in 1993, but only two companies—Ramgarh Minerals Ltd, an arm of the Rs1,800 crore MSPL Ltd, and Manmohan Minerals Ltd have so far been granted licences to prospect for gold in Karnataka and Jharkhand. The process of granting licences for exploration has been excessively slow because of laborious procedures. Under the current mining law, the states have the right of use of their minerals but have to consult with the Union government before allocating mines. Only eight companies have approvals for reconnaissance permits between 2005 and middle of this year, according to government data. The approved companies include Jindal Steel & Power Ltd, Rungta Mines Ltd, Crown Mining Ltd, Hira Kund Diamond Exploration, Amil Mining India Pvt. Ltd, and Deccan Gold Mines Ltd.